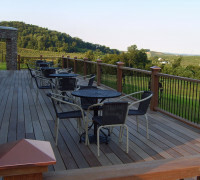 Bask on the sunlit patio of Hauser Estate Winery with a crisp glass of chardonnay, and you may begin to feel that you are in the rolling hills of California — but you are actually in Biglerville, Pennsylvania! Hauser winery refer to themselves as “an alternative agri-tourism venture”, which manifests itself as a hip place to chill. The tasting room features a 360 degree view of the surrounding farmland, with the wine production taking place just below your feet. The grapes are grown locally before they alchemize into wine. Hauser specializes in many varieties of white wines, some reds, and apple wines. The hard apple cider is especially popular. Tastings occur every day at the winery from 11-4pm, and on Sunday from 12-4pm. Generally, the tasting room closes around 5 pm in the winter, but there are plenty of special events that continue into the evening. “Hauser After Hours” is the weekend party which alway includes fresh acoustic artists. The winery also has yoga events, dance lessons, zumba classes, and Thirsty Thursdays. Every Friday is “Yappy Hour” from 5-6pm, where you can enjoy a drink with your dog. Downtown Gettysburg and Dillsburg retail locations bring Hauser’s products closer to home.